Home in need of a re-vamp? Or simply want to start afresh on all your interiors? Then you're in the right place. I am an interior designer in Cornwall with a passion for style. I work closely with clients to create a design that reflects their personality, producing a unique and truly personal solution. From a missing key piece, to a complete re-style, I'll work with you to create an environment you'll love. My fine art background taught me to think outside the realm of normal interiors, to think imaginatively through problems and briefs in order to create the best interior design solutions. My key skills would be complete interior design and styling, art and antique sourcing and bespoke furniture. All this to fit your style and budget, with a number of trade accounts including Fox Linton, Colefax & Fowler and Designers Guild to name a few. There are some examples of the interior projects I've undertaken in the portfolio section, ranging from sumptuous Ralph Lauren interiors to a slick city pad. Please, take a look and then drop me a line. 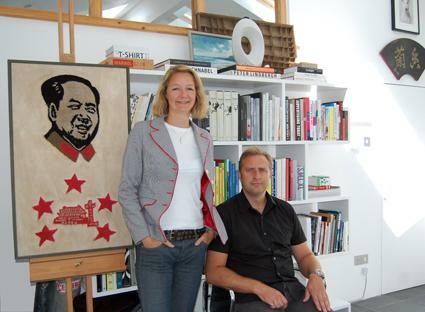 Ex-London husband and wife creative consultancy with over 35 years professional experience. Fees can be day rates or as project fees - it's entirely dependent on the specifics of the job - please drop us an enquiry, we're happy to chat and give you a quote. We're happy to do help with most projects - large or small.